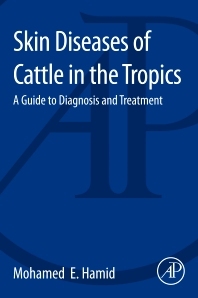 Skin Diseases of Cattle in the Tropics: A Guide to Diagnosis and Treatment is a clinical and practical guide to help animal scientists, field veterinarians, veterinary students, and technicians make appropriate and differential diagnoses. It features quizzes of clinical cases, along with multiple images of characteristic lesions and laboratory findings of major skin diseases (and diseases with skin manifestations) that are prevalent in tropical areas, notably the Sub-Saharan African countries. This self-learning and easy-to-use instructional guide, a unique offering in the field of animal science and veterinary medicine, provides essential and foundational information about relevant skin conditions that are followed by illustrated flow charts of laboratory diagnoses and summaries of respective diseases. This title makes the subject accessible for practicing veterinarians and animal scientists, and is particularly useful for those who have neither seen nor had the chance to see these diseases in the field or clinics. Such diseases are important not only in the tropics, but may be encountered in many countries in subtropical and temperate zones. Dr. Hamid is associate professor in the Department of Clinical Microbiology and Parasitology at King Khalid University, Saudi Arabia, with nearly 3 decades of experience in teaching, student management, research, and staff management. He holds an undergraduate veterinary degree and postgraduate qualification in clinical microbiology related to bovine diseases, and taught veterinary preventive medicine from 1997-2003 at the University of Khartoum.